The University of Washington Seattle campus has an average daily population that rivals any mid-sized city in the United States. We have our share of daily emergencies and incidents that are well managed through the professionals in our campus police department and the city of Seattle Fire Department. We occasionally have incidents that go above and beyond the daily norm. It’s important that we never forget these incidents. They often represent a nexus of our worst days and our finest hours in service and sacrifice to the public. In remembering these incidents, we remember the lives these incidents have touched and in some cases have taken. In that remembrance, we always seek to be better prepared for tomorrow. PS- Special thanks to NOAA, the National Weather Service, the OWSC and other groups that help us keep this list accurate. A condensed PDF version of the incident timeline is available here. 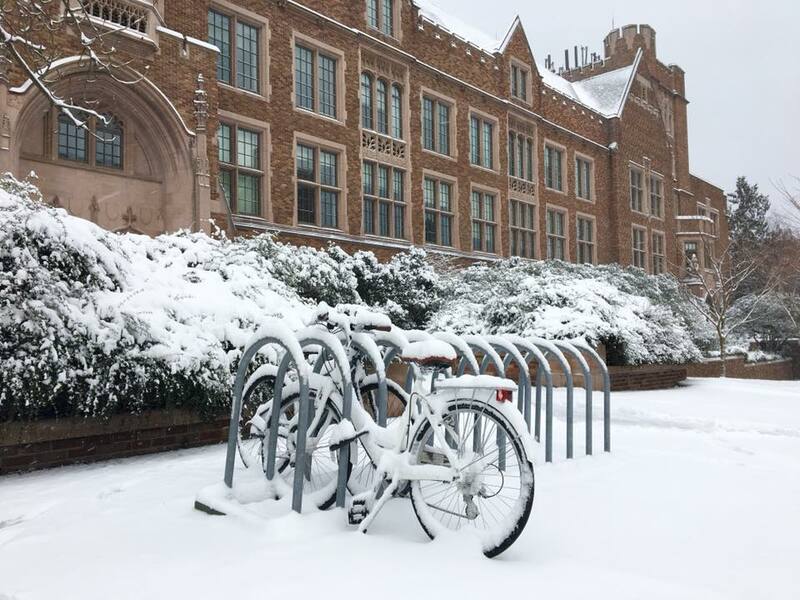 Though forecasts for Seattle predicted a trace to 1" of snow, UW students, faculty and staff woke February 4 to 2"- 4" of snow in Seattle (and up to 10 inches in the cities to the North and East). All three UW campuses suspended operations after an assessment of transportation conditions. The snowfall, coupled with strong winds and all-day below freezing temperatures and resulting icy roads snarled regional transportation systems and made travel throughout the region dangerous and difficult. Despite wide-spread traffic incidents, damage was limited and no direct fatalities were reported as a result of this lingering storm. A constant series of followup storms, roughly every 2-3 days, brought additional snow to all of Western Washington. By February 14th, the UW Seattle campus experienced a record seven days of either late start, early release or full-suspension of operations. This week long impact to the University was unprecedented and was one for the record books, with this February breaking all records for the snowiest February in Seattle history. Nearly 1,000 undergraduate and graduate student employees, members of the UW Academic Student Employee Union (affiliated with UAW local 4121) conducted a daylong series of marches, protests and rallies on the Seattle campus. Utilizing the non-violent tactic of blocking key traffic and road intersections in/out of campus, the protesters were demanding increases in pay and benefits. Many members of other UW unions supported the strike by not crossing the picket line, causing minor disruptions to other campus operations (i.e, food delivery, construction site access restrictions, etc...) The AM and PM commutes were severely impacted on campus. The EOC was activated at Level 3 to monitor and support the event. A large rally, demonstration and counter-protests were held on Red Square on Saturday, February 10, 2018. The UW College Republicans invited the Patriot Prayer Group to campus for a public rally and march throughout campus. Other counter-protesters also converged on campus. An estimated 400-600 persons clashed on Red Square with a heavy police presence. Only limited property damage occurred and a handful of arrests were made. Based on the anticipated campus disruptions, a number of public events on central campus were either cancelled or postponed. A large-scale, planned demonstration by the Patriot Prayer group in Red Square attracted an estimated 400 protesters and counter-protesters. A heavy police presence supplemented by a week of intense planning by campus departments, ensured that this rally and demonstration was peaceful. The UW's EOC was activated. 5 arrests were made, various planned events were cancelled or postponed due to the publicity. Minimal property damage occurred. A series of sporadic regional power outages impacted the areas adjacent to the UW campus. Beginning at 9:40 am and ending around 2:00 pm, these Seattle City Light power "spikes" and temporary outages caused the UW Power Plant to shut down twice for a short period of time. Many off-campus residence halls east of campus near the U-Village Shopping Center were impacted. Main campus mechanical systems, elevators, electrical circuits and communications systems had to be reset due to the power spikes. Temporary loss of the UW Power Plant boilers caused temporary reduction of hot water and steam to the UW Medical Center, impacting the surgical schedules for the day. A predicted snowstorm shut down the entire Puget Sound region on Monday, February 6th with the central Seattle area receiving between 4-9" of snow. All 3 UW campuses cancelled classes and suspended operations for the day. Limited power outages and road/transportation delays occurred throughout the region as reported by local media sources. Damage was limited and no direct fatalities were reported as a result of this fast-moving storm. Large-scale protests and counter-demonstrations took place on Red Square in the evening as a result of a controversial speaker in Kane Hall on the night of President Trump's inauguration. Estimates of over 1,000 people congregating on central campus with minimal property damage. One person was injured on campus as a result of a gunshot wound. The suspect was never caught. UW's Emergency Operations Center was activated to support an active on-site incident command structure and law enforcement. Wide impact power outages of the Seattle Campus and surrounding areas of the University District affecting over 20,000 customers. City Seattle Light said the outage originated from an unspecified technical failure at the UW's power substation located on East Pacific Place. The EOC was partially activated to support with response and public information coordination across the university and city partners. Approximately 1/4 of the Seattle campus went dark due to a failure of a high-voltage power line impacting nearly 20 buildings on NE Campus. This all happened on a cold, snowy evening when students were returning from Winter Break. The EOC was partially activated to coordinate response and public information efforts. The strongest Summer storm in Northwest history to date impacted the region with 60-70 mph wind gusts. The UW Seattle and Bothell Campuses were without power for a few hours. UW Emergency Management activated to level 2 (partial) and staffed the EOC with personnel from UWEM, UWPD and UWIT. Major Fall Windstorm hits King County in the evening at the same time as the UW/ASU Homecoming football game at Husky Stadium nationally televised on ESPN. Game continues with driving rain and 30-40mph winds with gusts up to 60mph. Moderate damage to vendor and patron tents in the “Zone” as well as significant power outages in in the region impacting over 200,000 residents. Partial campus power outage due to fire in an underground power vault. UW EOC went to a level II activation (partial) and brought in specific units to fill specific roles needed for the response. The power outage commenced around 5:30 PM and resolved around 9:00 PM. The far West and East areas of campus were impacted as well as the major roads of Campus Parkway, Brooklyn, Pacific and Montlake. Central Campus was not impacted. Report of the smell of natural gas in Fluke Hall. Hazardous materials response and evaluation by the Seattle Fire Department confirmed a release of a chemical by accident from a student experiment in the building. The chemical was determined to be non-hazardous and the building returned to normal operations. Boston, Massachusetts. Bombing of the Boston Marathon. UW EOC went to level I activation (proactive monitoring) and coordinated with local and regional partners on information exchange and intelligence from the Fusion Center. Campus-wide power outage that was caused by a lightening strike on a nearby Seattle City Light substation. The power was out for approximately 3 hours, but due to cascading issues, some areas of some buildings were out for as long as 14 hours. A 24 year old man with a complaint against one of the retail shops near the UW Bookstore on University Way used a pellet gun to shoot out some windows. Police response from the Seattle Police and University Police cornered the man at the intersection of 17th and 45th and he was safely taken into custody without further incident. Report of a noxious odor in Guggenheim Hall prompted a hazardous materials response. It was the second such response in as many days. the Seattle Fire Department was unable to detect any hazardous materials. The source was thought to be a storm drain. Report of a non-toxic refrigerant leak at Alder Hall. Initially the alarm was thought to be a faulty detection panel. It was later determined that the alarm was in response to a legitimate release of a non-toxic, oxygen-displacing gas that was the result of a leaky valve. There was no threat to the public or the occupants of the building from the material. North Eastern coast, United States. Hurricane Sandy made landfall, causing historic damage in New York and New Jersey. UWEM sent a staff member to respond as part of the Seattle Metropolitan Incident Management Team. Chemical spill in the EE-Wing of the UW Medical Center prompted a partial evacuation of that wing of the Medical Center. The spill was mitigated by the Seattle Fire department and cleaned up by a University contractor. The Medical Center remained fully operational during the incident. There was one exposure of a Medical Center staff member, but no injuries. Shooting at the Cafe Racer, 18 blocks north of the Seattle Campus, resulting in 5 victims, 3 of whom were fatalities. The incident was later resolved in West Seattle where the suspect died of a self-inflicted gunshot wound. The suspect was also connected to a shooting in downtown Seattle that day as well. University police assisted the Seattle police at the scene and University Emergency Management monitored the incident as it evolved. There was no verifiable threat to the UW Seattle Campus. Entire UW-Seattle campus lost power (as well as many portions of Central Seattle) for 4-hours during the day from ~3-7 pm. This occurred during Winter Finals and just prior to the tipoff of the NIT National Basketball Tournament at HecEd Pavilion. This was the first campus-wide power outage in over 16 years. Critical systems such as the UW Medical Center were protected via local emergency power generation. Short in high-voltage underground power vault off-campus at Pacific and Brooklyn Avenue caused a 24-hour power outage to the SW parts of campus. Major buildings impacted included the UW Police Building (and 9-1-1 dispatch) as well as 700+ residents of Stevens Court. Seattle City Light restored power 24-hours later. Minor disruptions to campus operations, with major traffic backups along Pacific Avenue. Two separate Occupy Seattle protests and marches impact central and west campus. The UW’s EOC was partially activated for 8 hours to coordinate the logistics and operations for this 200+ member protest. Large emergency services response to Odegaard Undergraduate Library for possible HazMat release. Determined by the Seattle Fire Department to be a hoax as part of the perpetual ‘zombies vs. humans’ game played by students on campus. Report of 6.4 earthquake on Vancouver Island in British Columbia, Canada. No reports of damage or injuries related to the earthquake at the UW or in the Seattle, Puget Sound region. Seattle Fire Department, University Police, EH&S and Emergency Management response for suspected Freon release in K Wing of the Health Sciences building. 1 patient transported to hospital. No chemical agent detected. Protesters performed a sit-in protest in Schmitz Hall over concerns with the University’s Sodexo contract. 14 protesters were arrested for Criminal Trespass after ignoring a warning issued by University police that the building had closed at 5:30 PM. Protesters performed a sit-in protest in the office of the Director of Athletics over concerns with the University’s contract with Sodexo. 13 were arrested for Criminal Trespass and were released at the scene. Protesters performed a sit-in protest in the President’s office of the University’s contract with Sodexo, a food service company. The sit in lasted several hours. 25 of the original 40 protesters in the sit-in were arrested for Criminal Trespass and released at the scene. Report of unknown chemical causing reaction to skin and eyes for people in Parrington Hall. Multi-agency response. Chemical thought to be fumes from industrial cleaner. Late fall storm with record temperature lows. A storm came over the center of the Olympic Mountains and hit Seattle with sub-freezing temperatures as low as 12 degrees, winds with gusts up to 40 mph and enough snow and ice to cause the University to go to suspended operations. Unusual football game. For the first time in 60 years, the UW held a mid-week football game. The game started at 5:00 PM and had significant impacts on regional commuting as well as regular University academic and administrative campus operations. Sitting US President, Barack H. Obama, the Nation’s 44th President, spoke at the Hec Edmundson Pavilion and Husky Stadium to a combined crowd of 14,000 people. Although the University regularly entertains various VIP’s and dignitaries, this is the first time in 49 years a sitting US President has visited the University of Washington. The last visit was from President John F. Kennedy in November, 1961. Protest event on campus. Democracy Insurgent and UW Student/Worker Coalition are the primary organizers. Voiced intent to block access to campus. No action taken to do so. Approximately 60-100 protesters showed up. Minor incidents of blocking traffic on Steven’s Way. No vandalism, injuries or arrests. HazMat release in Chemistry Building. Bromine and Methyl-Chloride. No serious injuries. 3 students treated for respiratory irritation by Seattle FD. Protest event on campus. Democracy Insurgent and UW Student/Worker Coalition were the primary organizers. Estimated 600 people. No vandalism, injuries or arrests. Protesters voiced intent to take the UW Tower and I-5, but did not act on these. Return outbreak of H1N1. Campus vaccination clinics opened. H1N1 initial outbreak of Swine flu at the UW. Large HazMat response by Seattle fire to Hall Health. Source of release was a can of bear mace that accidentally discharged in someone’s purse. No injuries. Major Winter Storm. Significant snow and ice. UW Seattle campus went into suspended operations for a few days. Midday self-immolation by a former UW employee on Red Square during classes. Coastal Winter Storm. Winds up to 50-60 mph with gusts into the 90’s on the Washington coast. This unusual storm lasted 24 hours rather than the typical 4-6 hours. Flooding near Chehalis, WA, resulted in the temporary loss of I-5. No significant damage to the UW campuses reported. Shooting of a UW employee in Gould Hall by a non-UW person. Determined to be a murder-suicide. This was the first time the UW’s Campus Emergency Response Team (UW-CERT) was activated for an emergency. UW-CERT assisted UW police by establishing and maintaining the outer-most perimeter. Hanukkah Eve Storm. Winter storm with ice and gale-force winds with gusts up to 80 mph left 1.5 million people without power across Western Washington. UW Seattle campus had minor damage from debris and a tree falling onto a bus stop shelter. No injuries reported. UW Bothell had significant power outages. UW Tacoma had no damage to report. Suzzallo Library fire in a power closet in the basement level, 1963 wing. Resulted in total power loss for over a week. Suzzallo remained functional from an emergency generator brought in to provide power. Hurricane Katrina. The UW hosted several displaced students and staff from Hurricane Katrina. As part of the effort, the UW activated assistance centers on campus to provide information and help with victim advocacy. Educational Outreach fire. Estimated $1 million in damage. Terrorist attacks on New York City and Washington D.C.
Firebombing of the Urban Horticulture Center by the Earth Liberation Front (ELF). $6 million in damages; 20% of the horticulture library was lost. Some researchers lost their life’s work. Earthquake: Mag 6.8 Duration 45 seconds. Fallen ornate columns on the top, west-facing side of Suzzallo Library, fallen sprinkler fittings from the ceiling of the HUB, fallen acoustical ceiling tiles in Odegaard Library and the Intramural Activities Building (IMA), cracks in several other campus buildings. The Conibear shell house, Engineering library, Schmitz Hall and HSB-T wing all had to be temporarily closed for cleanup of debris and HazMat (primarily asbestos). Possible teaching assistant strike. Strike averted but EOC was prepared for activation. Had strike occurred, disruptions to mass transit, delivery of mail and other supplies would have followed. UW Medical Center shooting. Two people died in a murder-suicide. UWMC emergency planning helped reduce psychological effects on staff following the incident. WTO protest march. 1,500+ individuals involved. Students marched downtown. Very minor disturbance on campus. UWPD escorted students to the mass demonstration downtown to protect them from traffic. WTO protest. Estimated 300 involved. Rally in Red Square. Minor disturbance. One arrested for climbing the flag pole at Memorial Way. 60+ individuals protested a graphic CBR display. Protesters blocked CBR from setting up the display. four panels of the 25 panels were set up in Red Square. Officers kept protesters 6 feet away from the panels. Eight panels from the Center for Bio-Ethical Reform (CBR) display were defaced. The cost of repairs was estimated at $1,800. 12 glass ampules containing a foul smelling liquid were broken near the CBR display. No arrests made. Earthquake- Mag 5.1, centered in Satsop, WA. No reported damage to UW buildings. Animal Rights Protest. 60+ individuals involved. Picketing of UW buildings and a 20-hour “sit-in” at President McCormick’s Office. Minor disruption. No arrests made. Animal Rights Protest. 30 individuals involved. Minor disturbance at the HSB. One broken window. Two arrests. Kincaid Hall laboratory fire. Fire destroyed years of research, irreplaceable biological collections, data and equipment. The lab was unusable for eight months. Estimated cost was $1.5 million to $2 million. Earthquake. Magnitude 5.3, centered in Duvall. No damage reported to UW buildings. Shooting in the HUB gaming area. One person injured. Treated at UW Medical Center. Inauguration Day Storm. Considered by some to be the most powerful storm since the 1962 Columbus Day Storm. A faulty electrical cable caused an underground fire. The age of the cable was blamed. Cost of repairs was $50,000. A bomb damaged the Memorial Way gatehouse. A pipe bomb caused heavy damage to the structure. Apple Cup. Thousands of football spectators rushed the field, overwhelming police and security officers. Objects were thrown at the officers and the goal posts were uprooted. Three officers and numerous students were injured and required medical treatment. Two UW students, one male and one female, were shot to death as they stood outside their classroom. The suspect was the former boyfriend of the female student. Total of nine shots fired. No other injuries reported. Suspect was quickly arrested. Engineering building fire caused by arson. $200,000 in computers were lost and $10,000 in structural damage. Engineering building fire. Deemed unlikely to be arson. Caused $15,000 in damage to equipment. Officer-involved shooting of a suspect who attacked two UWPD officers with a knife. Wounded UWPD officer fatally shot the suspect in defense of his and a fellow UWPD officer’s life. The shooting was determined to be justified. Bagley Hall fire in one of the labs was caused by an overheated motor igniting nearby combustible materials. At 10:09 a.m., a section of Husky Stadium that was under construction collapsed. It was a 215-foot addition to the bleachers; it collapsed into a 250-ton pile of steel. No injuries occurred. A major fire occurred on the 13th floor of the Health Sciences BB Tower (Room BB-131). It started in a fume hood when a Bunsen burner caught a rubber tube on fire - then spread outside the fume hood. The lab technician was unable to turn off the gas feeding the burner and it quickly spread out of control. Once the fire was finally put out, the lab and four adjacent rooms suffered major fire, smoke and water damage. The fire burned so hot that it melted the Pyrex lab piping above the ceiling tiles and was just about 2 minutes from leaping to the next floor. Residual smoke damage can still be seen on the north-facing exterior of the building. Unusual event of a pair of storms hitting the Pacific NW. The first was on Nov 13 and the second on Nov 15. Estimated 1,200 protested U.S. action in the Middle East. Fighting and disruptions occured. UW employee shot to death on Parrington Lawn. Boyfriend was arrested as the suspect a few days later. Sniper on campus critically wounded women during a women’s conference. Five hostages taken at Bagley Hall, bound and placed on the floor while the suspects attempted to rob the building. Shots were fired, but no injuries. Pipe bomb found in the bottom of the Administration Building. Defused by Seattle police bomb squad before it could detonate. Protesters broke into 12 Padelford Hall offices and caused $10,000 in damage. Shooting between Kane and Condon Hall. One fatality. Suspect arrested. Weapon was a .38 caliber hand gun. Clark Hall, the ROTC building, was the target of a bombing. Unknown damage. Gerberding Hall was the target of a bomb; $291,000 in damage to Gerberding Hall, Suzzallo Library and Parrington Hall. Structural damage to Gerberding Hall was extensive. 200 Seattle and King County police officers occupied buildings at the University of Washington after demonstrations over several days by the Black Students Union and the Seattle Liberation Front disrupted classes and injured 17 people. Bombing attempt on the ROTC building by the Weathermen protest group. The suspects were caught and arrested before the bombs could be planted. Contingent of approximately 40 SDS (Students for a Democratic Society) activists trashed the University of Washington ROTC quarters in Clark Hall and assaulted two officers. Clark Hall, the ROTC building on campus, was the target of an arson. The fire caused $100,000 in damage. Mag. 6.5 quake, duration 30 seconds. Superficial damage reported for one-third of UW buildings. Cracked beams also reported in the Communications Building. Labs were disrupted and playing fields were damaged. “Columbus Day Storm.” One of the largest extratropical cyclones in the last 100 years, causing widespread damage across the West Coast and the Pacific Northwest. President John F. Kennedy, the nation’s 35th president, spoke at the Hec Edmundson Pavilion to a crowd of 11,000 people. Earthquake: Mag. 7.1. Damage to masonry buildings; Chimneys damaged. Plaster cracks and broken windows reported on much of campus. Unsecured equipment was damaged. Water mains broken. Land near stadium cracked and “oozed”.